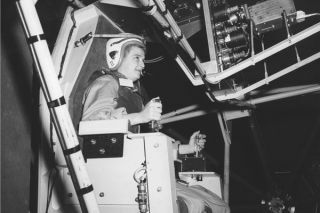 A well-known female pilot, Jerrie Cobb, testing the Gimbal Rig. In this historical photo from the U.S. space agency, Jerrie Cobb, a well known female pilot in the 1950s, tests a Gimbal Rig in the Altitude Wind Tunnel (AWT) on April 6, 1960. The Gimbal Rig, formally called MASTIF or Multiple Axis Space Test Inertia Facility, was used to train astronauts to control the spin of a tumbling spacecraft. The Gimbal Rig was a wild ride. Three aluminum cages revolved separately or in combination to give roll, pitch and yaw motions at speeds up to 30 revolutions per minute. An control station operator would start the tumbling motions, and then switch control to the pilot. By reading instruments mounted at eye level before him, the pilot interpreted his motions and made corrections. The setup was used to measure instrument controls as well as the physical effects of spinning, such as motion sickness and eye oscillation. Cobb was the first female to pass all three phases of the Mercury Astronaut Program, but NASA rules stipulated that only military test pilots could become astronauts and there were no female military test pilots. Cobb completed this astounding feat in 1961. The MASTIF was installed at the Altitude Wind Tunnel at the Lewis Research Center, now John H. Glenn Research Center.